Be jealous of these people, and not only for their deep cash reserves. Besides being influential enough to compel Mercedes to continue offering luxury station wagons here even as the world—and the rest of Benz’s operation—embraces crossovers, they’re getting a new steed, the 2018 E63 S wagon, that is a majestic four-wheeled unicorn. Any Benz wagon, let alone an AMG variant, is a rare sighting. (Need we even point out that, among Benz’s competitors, only Volvo sends a large wagon to the U.S., and other high-performance luxury wagons aren’t sold here, period?) 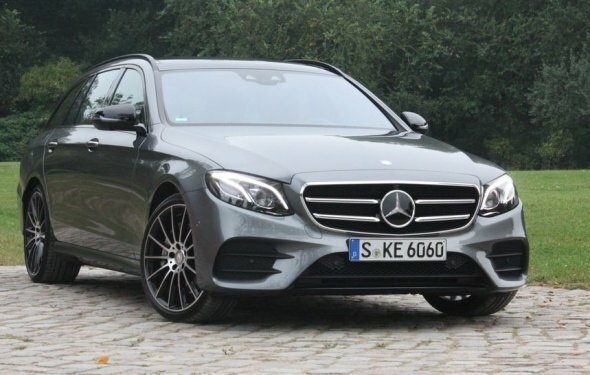 Few uninitiated motorists will even notice the regular wagon; those who pick up on the E63’s four rectangular exhaust outlets jutting from the rear bumper or the enlarged air intakes in the front fascia might simply be confused. To those in the know, however, the E63 S wagon represents the pinnacle of under-the-radar high-speed machinery. We think the whole concept is spectacular. As before, the E63 wagon stuffs the same go-fast engine, braking, and handling bits that AMG installs on the E63 sedan into a newly gorgeous, longroof body. And once again, the wagon comes only in “S” tune with the sedan’s more powerful engine option. This time around, that engine is a twin-turbocharged 4.0-liter V-8 (versus the outgoing 5.5-liter twin-turbo V-8) rated at 603 horsepower and 627 lb-ft of torque. According to Mercedes, its turbos’ 21.8 psi of boost blown through the turbos is responsible for its 40-hp and 74-lb-ft advantages over the “base, ” non-S E63 sedan’s otherwise identical V-8 force-fed with 18.9 psi. Despite its bristling muscle, the E63 wagon also is intended to serve luxury-cruiser duty, and as such it rides on a suspension equipped with adaptive dampers and air springs. The dampers can be adjusted via the drive modes from soft (Comfort mode) to firm (Sport+), and if our experience in the 2018 E63 sedan is any indication, the setup should return a compliant ride in the less sporty settings. The interior, likewise, is as plush as those found in regular E-class models, only with more carbon-fiber detailing. The dashboard and door panels are wrapped in nappa leather, and the dual 12.3-inch LCD displays for the gauge cluster and dashboard carry over from lesser E-class models. Available sport seats with integrated headrests, silver-colored seatbelts, and a steering wheel with a gray centering stripe allow buyers to turn up the wattage. Lazier drivers can indulge in the same Drive Pilot semi-autonomous technologies that debuted on the 2017 E300 sedan, which include automated emergency braking, a self-steering function, adaptive cruise control, and an impressive suite of sensors that keep track of everything around the vehicle. The AMG wagon boasts the same cargo-hauling advantages over its sedan sibling as does the decaffeinated E400 wagon, with 35 cubic feet of cargo space behind the rear seats. Mercedes brags of “a new cargo-related functionality:” the rear seatbacks can tilt forward 10 degrees, clearing out more room for cargo behind them (and also improving rear-seat passengers’ posture). Those 40/20/40-split rear seatbacks can be folded flat, too. Sadly, rear-facing third-row seats still aren’t offered in the E63 wagon; they remain available in the current E400 model, though. Only children could fit in them, but as we’ve always said, why not start the rascals’ horsepower addiction young and, um, backward? On the plus side, as is the case in the E400 without third-row seats, ditching the wayback chairs swells the total cargo capacity by 12 cubic feet, to 35 total. Similarly, the E63 S wagon’s price is sure to inflate somewhat relative to its predecessor. The outgoing E63 S wagon retailed for $105, 225, and when order books open this fall, the 2018 E63 S wagon’s MSRP surely will be higher. You might be wondering if there are really people out there with 100 grand to drop on a 603-hp wagon, but remember, a majority of that pool has probably already dropped $100, 000 on a 577-hp wagon (that’d be the last E63). They likely will be as excited about the new one as we are.